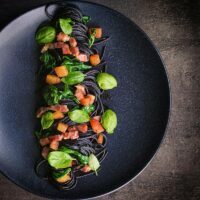 Squid ink pasta is a great way of adding extra drama and flavour into simple pasta dishes, this great recipe comes together in around 20 minutes and is always a winner. 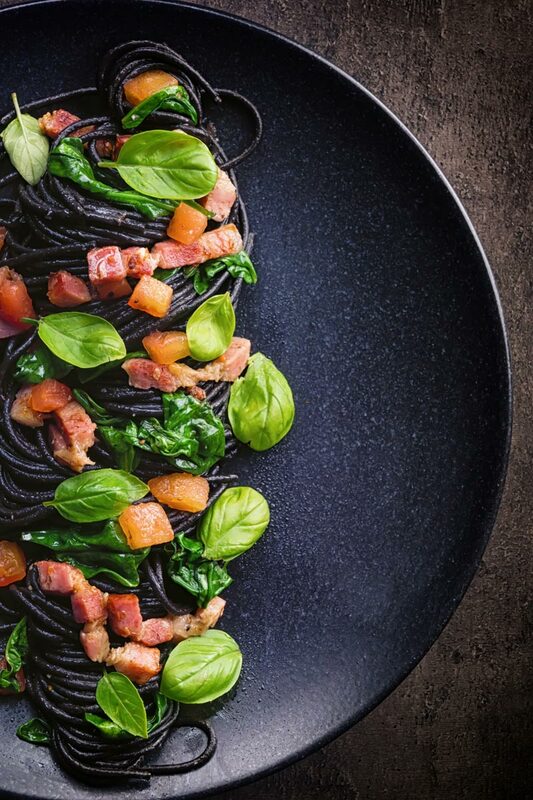 Squid Ink Pasta with Bacon, Spinach and Capers. 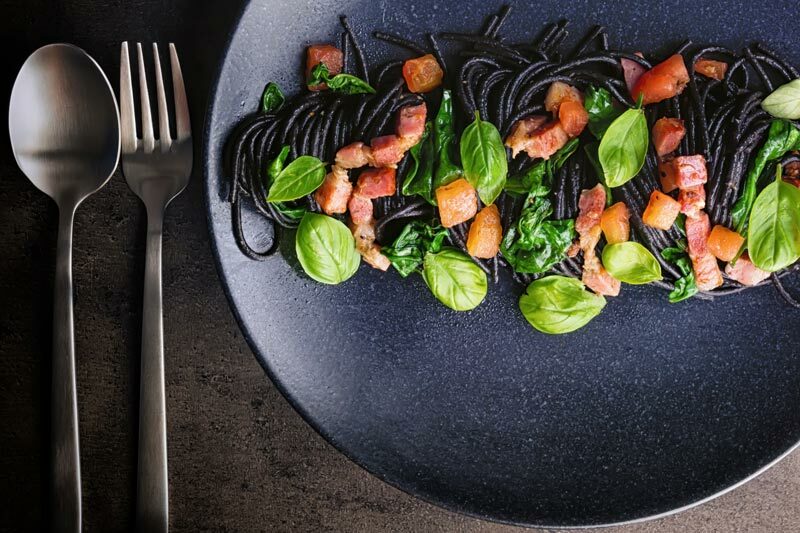 This squid ink pasta recipe with bacon, spinach and capers is not the first time the very dramatic black pasta has appeared here on Krumpli. I love the stuff, it adds so much drama to a dish but also a subtle but great flavour. The obvious pairing with squid ink pasta is fish as in my squid ink spaghetti with shrimp and fennel. But it really works well with a host of other flavours too, anything that works well with fish or seafood is your mojo. Peas and salami are a great option, a combination I have used in this squid ink spaghetti recipe as well as in this superb pan-fried cod recipe. Here, however, I have gone with bacon for the salty and meaty flavour, capers for the zingy high notes and some spinach for the iron richness. Of course, we have a little garlic because, well garlic and tomatoes for a little sweetness. This simple pasta recipe in all of its dramatic glory also takes less than 25 minutes to cook. I mean how easy is it to impress someone with food? What Does Squid Ink Pasta Taste Like? The flavour of squid ink is not as strong as you may imagine. It adds a light salty and almost ‘oceanic’ or ‘ozone’ flavour to recipes it is used in. Subtlety is good in food too, it is not all about shouting and insanely big flavours. Says the dude who loves shouty big flavours. Squid ink in pasta also changes the texture a little and creates something I find really quite wonderful. Pasta is in the main just egg and flour so even the smallest addition can have a dramatic effect. For me, the pasta almost becomes silkier or more velvety, which makes al dente pasta so much more special. Squid ink has been used for millennia and it certainly is not a new ‘thing’. In years gone by we would not have wasted any part of any animal we sourced for food. So it is only natural that a use for the ink of a squid would have been found. But it is not just about squid ink pasta, there is a glorious risotto dish featuring squid ink. A recipe I am really eager to make, alas finding the ink on its own is pretty tough here in Hungary. This simple squid ink pasta recipe is perfect quick summer food if you ask me… 10 minutes prep time and 10-15 minutes cooking time really helps keep the temperature in the kitchen down. However, pasta is always a hearty and filling meal too, summer is often draining so I definitely need hearty meals at this time of year. I have a host of pasta recipes like this that are not overloaded with heavy sauces. Just olive oil and great seasonal ingredients are all you really need. Peas are wonderful at this time of year and add such a great sweetness to simple pasta recipes. I have a more than a few pea pasta recipes here on Krumpli. This pesto, pea and goats cheese spaghetti is superb. But you can go in a slightly different direction and create a wonderful pea ‘velouté’ and use it as a sauce or dressing for rigatoni pasta. Go ahead tell me your favourite simple but tasty summer pasta recipe. I would love to give them a spin! Who said pasta cannot be elegant or dramatic? 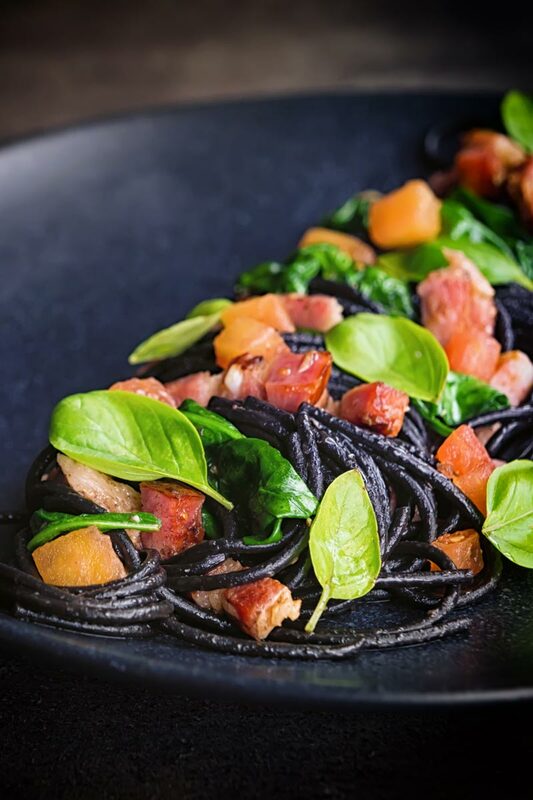 This black squid ink pasta recipe is simple, delicious and steals the show in the looks department! Roughly chop your anchovy fillets. Cut your bacon in to batons 3cm long and 5mm in profile. Cut a cross into the base of your tomato and when the water is boiling drop it in ancd boil for 30 seconds. Transfer to a bowl of ice cod water and then peel, dessed and cut into 5mm dice. Drop your pasta into the boiling water and cook as per the instructions on the pack removing 60 seconds from the cooking time. Heat a large frying pan over a medium high heat and when hot add the olive oil. Add the garlic and anchovies and cook for 60 seconds. Then throw in the bacon and cook until golden, this should be pretty much when your pasta is ready to be drained. Pick the stalks from your spinach. Drain your pasta reserving a little water and add to the garlic, bacon, and anchovies. Add the spinach, capers and tomatoes along with lots of freshly ground black pepper. Toss the pasta until the spinach wilts, dress with more olive oil and then serve. Add basil leaves to dress. This looks so delicious! I wish I could easily find squid ink or squid ink pasta here. Thanks Jessica, such a shame you cannot find it. This is truly a work of art. I have never had anything like it but surely would love it. You are one talented chef. Thanks for sharing your talents with us. 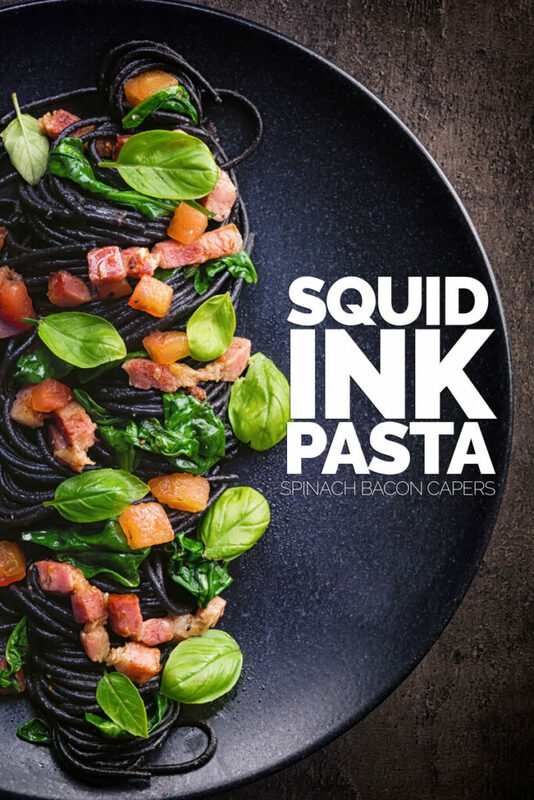 I have never had squid ink anything before – I think it’s about time I branch out some more because silky, velvety al dente pasta sounds pretty amazing and I think I will quite enjoy the flavoring you described of this pasta – beautiful dish! I love squid ink pasta. It’s one of my favorite ever pastas! This sound delicious with the bacon ( I also love bacon LOL). I like that you used a lighter sauce so the flavor of the pasta comes through. 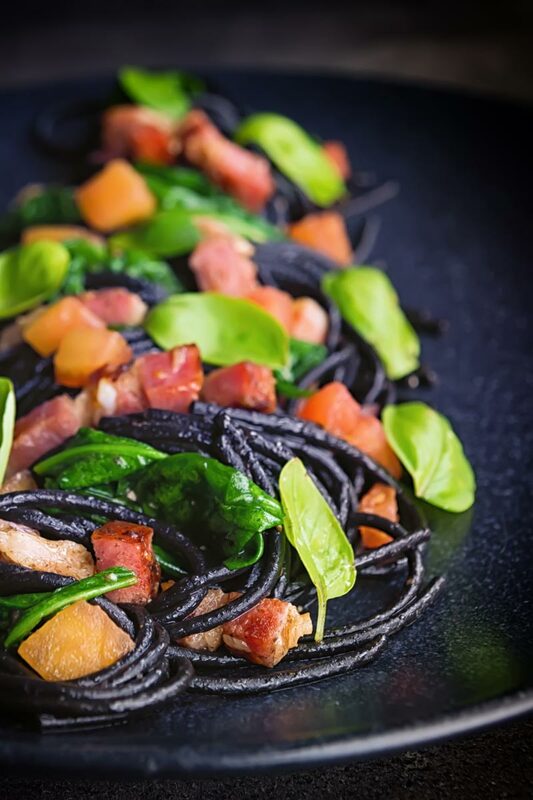 I have never had squid ink pasta, but it is an absolutely gorgeous and elegant looking dish! I would definitely give it a try! Thanks Shelby you really must try some. I’ve always been curious about squid ink pasta, and I like that you’ve explained the details of the flavors of squid ink. The dish is plated so well, it looks so elegant! Must get my hands on some squid ink spaghetti soon. Thanks Shinta, it really is great stuff, hope you can find some.